If you watched the final 4 basketball tournament you would have seen 545 million dollars worth of ads that corporations spent to try to sway your attention from hoops. If you are Chevrolet, you spent approximately $70 million to generate interest and leads to a vast, complex network of car websites such as pontiac.com. This search marketing chart shows traffic to major advertisers websites skyrocketed during this event, unfortunately this did not translate into actual sales. According to Autodata car dealer marketing, Pontiac sales were up 6% in March but Chevrolet sales were down 1%. Ouch. Chevrolet may want to consider refining their lead generation funnel and update their online customer acquisition process. 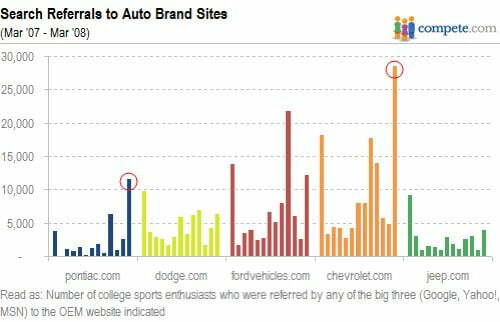 Read more about chevrolet and pontiac driving online leads at Compete.com.